The city of Edinburgh is well served by the public transport system, which includes an excellent network of buses and trains, providing good connections throughout Scotland and England. Edinburgh is located close to many other interesting towns, cities, tourist attractions and important landmarks, and many visitors also travel outside of the city, into the surrounding areas, such as Glasgow and Paisley. 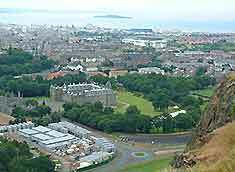 Renting a car is often the preferred method of transport for excursions from Edinburgh and it is relatively easy to travel around the area by car. There are a number of major roads situated on the outskirts, such as the M8, the M9, the M90, the A702 and the A68. 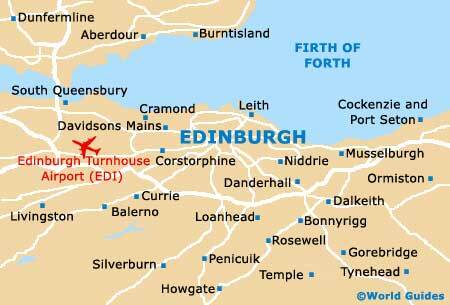 Edinburgh Airport (EDI) is situated just 12 km / 8 miles to the west and has good connections. This important, busy Scottish airport deals with some 200,000 passengers each month and comes with good overall amenities. The city is also served by Glasgow International Airport (GLA) - found 89 km / 55 miles from Edinburgh city centre, and by Glasgow Prestwick International Airport (PIK) - located 128 km / 80 miles from Edinburgh. All these airports are within easy travelling distance of the city, either by train, coach or car. Major airlines at these airports offer the greatest number of departures, whereas smaller airlines offer low-cost, no-frill airlines with a more limited number of flights arriving and departing from the airports. Edinburgh city centre has a large network of one-way streets and pedestrian-only areas. This can make driving here difficult and Princes Street also has limited access for private vehicles. Therefore, the surrounding roads are becoming increasingly busy, and although the traffic in and out of Edinburgh can be heavy during peak commuting hours (07:30 to 09:30 and 16:30 to 19:30), driving in the centre is fairly easy. Several roads in Edinburgh are one-way only and part of the city centre is restricted to buses and taxis. Many tourists staying in the city choose to rent cars and these are the best method of transport if you plan to explore the surrounding Scottish countryside and nearby towns. There are plenty of parking garages and off-street parking areas available in Edinburgh, although many areas are restricted to residents only and parking permits are required. There are also park-and-ride services, where you can park your car on the outskirts and then travel into the centre by bus. The Edinburgh bus system is operated by Lothian Buses and covers the city well. Buses are heavily used by both locals and tourists alike and provide a particularly inexpensive way to travel in Edinburgh and the surrounding areas. Local buses travel to many other towns and areas nearby, including Mid and East Lothian. Bus passes are available for set periods and these can be particularly convenient. Lothian Buses's city centre Travelshops provide details and maps of all Lothian Buses services in the area. Most buses and coaches in Edinburgh depart from the St. Andrew Square Bus Station in Clyde Street and from Princes Street, Nicolson Street and North Bridge. There are also many bus stops throughout the city, with bus timetables and route information. Edinburgh's other main bus company is FirstBus, which incorporates SMT, Eastern Scottish, Lowland Omnibuses and Midland Scottish. Although the FirstBus and Lothian Buses run similar bus services along many of the same routes, day tickets are not transferable between the different bus services. Coaches in the Edinburgh area are run by the United Kingdom's large coach network, National Express, and regularly travel to England and Wales. Scottish Citylink buses also serve the city and operate throughout Scotland. The central railway station is Waverley station, located in the New Town area of Edinburgh. This important railway station serves the East coast, with main lines running to London and Aberdeen. Scotrail services travel to a wide range of destinations throughout Scotland and the Edinburgh area, including good connections to the West Coast and a shuttle service that travels to Glasgow every 15 minutes. Local services also head to the east of the city and West Lothian. Haymarket Station is the city's other main train station and is situated on the main line to Glasgow. Most of the trains that run north and west from Waverley Station stop at Haymarket Station, as do regular services to West Lothian. 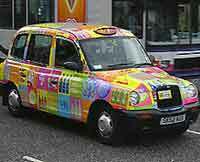 Taxis in Edinburgh are particularly convenient for short journeys and are usually reasonably priced. They can be easily caught from the taxi rank outside of the Waverley Train Station. Also in quieter areas of Edinburgh, taxis can be ordered by telephone and there are a number of reputable taxi firms that your hotel can recommend. Additional charges are often made for luggage, after-hours services and extra passengers, and on public holidays. Catching taxis in central Edinburgh is usually quite easy. The most recognizable, reliable and safest way to do this is to look for the traditional black cabs, with their yellow 'for hire' signs. Operated centrally through licence with Edinburgh City Council, the registered cabs can be hailed from most of the central areas of the city by an obvious wave or desperate gesture from the side of the road. There are various taxi ranks (official taxi gathering places) dotted throughout the city. These black taxis take up to five passengers and have facilities for travellers with disabilities. If you need to guarantee arriving somewhere punctually however, take time to book ahead. Try some of the reputable taxi firms listed in the taxis section of the Yellow Pages or alternatively, your chosen hotel will be able to recommend reliable taxi firms. Of note, many cabs now take credit cards, but this is always worth checking first.